For over three decades, the Islamic Development Bank Scholarship has helped to provide scholarship opportunities to 15,611 students and formed a pool of 13,253 well-trained development professionals and researchers transforming their countries and positively impacting future generations. The Programmes are an important tool in the development initiatives led by the IsDB since 1983 to foster technology and knowledge sharing among member countries and Muslim communities in non-member countries. The Programme is more than just a scholarship programme in the traditional sense of a straight financial assistance to qualified students. It is also a tool for the improvement of the socio-economic conditions in general. It is a scholarship programme and a development programme at the same time since the students are required to play a leading role in assisting the development of their communities and countries. In other words, the IsDB aims to produce Good Citizens and Talented Professionals (GCTP) at the same time. Completed senior secondary education (or the equivalent of approximately 12 years of education) with good grades in major subjects. Not in receipt of any other scholarship at the time of application and during studies under the IsDB scholarship programme. Be medically fit and willing to undergo medical tests after selection. Health: Medicine, Dentistry, Pharmacy, Nursing, Medical Laboratories, Microbiology, Public Health, Nutrition, Health Services Management, Bio-Medicine, Medical Technology, Veterinary, Chemistry, Biology, Bio-Technology and related fields. Selected students must obtain an admission only from one of the universities listed among the top (10) universities in each country. The Committee reviews the applications keeping in view the eligibility requirements and selection criteria of the Programme with the aim of identifying the candidates with the highest potential. The Programme offers scholarships leading to a full-time Master degree (in 2 years maximum) either through course work, research or a combination of both. Whichever the mode, it must be completed within the specified two-year time frame and there is no possibility of an extension with the IsDB funding. The scholarship is awarded as an interest-free loan (Qard Hasan) to the students. They are required to repay 50% of the loan after graduation, in easy installments to ensure the programme continuity in the long run. Besides, the students are also required to take part in the development of their communities/countries, through their respective professions, while the community development services rendered by the graduates will contribute to the overall development of their communities/countries. Be a graduate with a grade above “Good” in his/her bachelor studies. Plastic pollution and Micro-plastics: Plastic Incorporation into the Food Chain, Biodegradable Plastics, Recycling Possibilities. Water and Hygiene: Water Purity and Availability, Sanitation and Quality. Innovation & Infrastructure Development: Build Resilient Infrastructure, Innovation and Industrial Development, Technological Infrastructure, Product Innovation. Islamic Economics, Finance and Banking:Mode & Services of Islamic Banking and Finance, Sharia Standards for IFIs, Islamic Insurance & Takaful, Islamic Capital Market, Sharia & Operational Aspects of Sukuk, Islamic Micro-Finance, Zakat Management, Awqaf & Zakat Management. 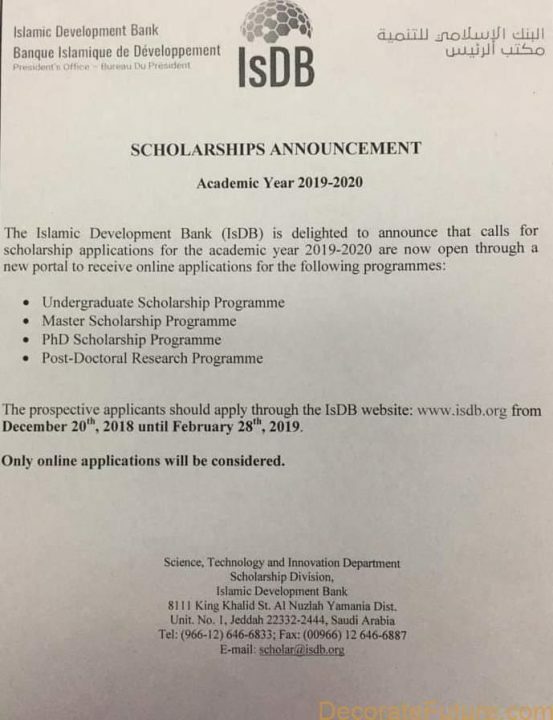 You Can For The Islamic Development Bank Scholarship from the link given below.